I have a client who has forward head posture and neck pain, and doing chin nods seem to make her neck feel worse. If chin nods are supposed to be good for neck issues, then why isn’t this exercise working? Chin nods involve craniocervical flexion or upper neck flexion. This is head on neck motion, with the axis of rotation through the ears. This exercise can be very good for people with neck pain, as it trains the deep neck flexor muscles. 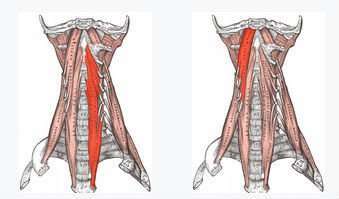 The deep neck flexor muscles (longus capitis and longus colli) are often inhibited and weak in people with neck pain. First, see if your client is performing chin nods using just head on neck motion. She might be flexing through the rest of her neck too. If your client is having a hard time finding just head on neck motion, ask her to decrease the range of motion. You could try cuing her to imagine an axis of rotation through her ears. You could also try an imagery cue, and ask her to imagine her head rolling like a ball. You could modify this exercise to help make it easier to isolate head on neck motion by using a weighted ball under her head in supine, or with a coach ball behind her head against the wall in standing. Next, look at your client’s neck muscles when she does this exercise. 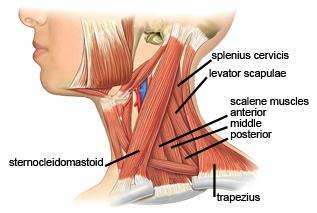 In people with neck pain, a common muscle recruitment pattern is to overuse superficial muscles, particularly scalenes and sternocleidomastoid, and for the deep neck flexors to be weak. Try this on yourself: do chin nods and feel the front and sides of your neck by putting your hands over your SCM muscles. Can you do chin nods and keep these muscles “quiet”? How far can you nod your chin before they turn on? Try doing this with your client, but initially keep the range of motion small. It might be challenging for her to feel this at first. 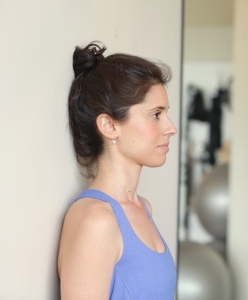 If this exercise is still not working, you could try to make it easier by placing a small rolled towel behind her neck (just filling the gap in the natural lordotic curve of her neck). You could also make it less work against gravity you could also try it on an incline with her head raised (e.g. use a wedge cushion, a jumpboard propped up on the shoulder rests of the reformer, or with pillows). You could also try it standing with the back of her head against a wall.